In mathematics, a pair of pants is a surface which is homeomorphic to the three-holed sphere. The name comes from considering one of the removed disks as the waist and the two others as the cuffs of a pair of pants. Pairs of pants are used as building blocks for compact surfaces in various theories. Two important applications are to hyperbolic geometry, where decompositions of closed surfaces into pairs of pants are used to construct the Fenchel-Nielsen coordinates on Teichmüller space, and in Topological quantum field theory where they are the simplest non-trivial cobordisms between 1-dimensional manifolds. As said in the lead a pair of pants is any surface which is homeomorphic to a sphere with three holes, which formally are three disjoint open disks removed from the sphere. Thus a pair of pants is a compact surface of genus zero with boundary, the latter being three circles. The Euler characteristic of a pair of pants is equal to -1. Among all surfaces of negative Euler characteristic it has the maximal one; the only other surface with this property is the punctured torus (a torus minus an open disk). The importance of the pairs of pants in the study of surfaces stems from the following property: define the complexity of a connected compact surface of genus with boundary components to be , and for a non-connected surface take the sum over all components. Then the only surfaces with negative Euler characteristic and complexity zero are disjoint unions of pairs of pants. Furthermore, for any surface and any simple closed curve on which is not homotopic to a boundary component, the compact surface obtain by cutting along has a complexity that is strictly less than . In this sense pairs of pants are the only "irreducible" surfaces among all surfaces of negative Euler characteristic. 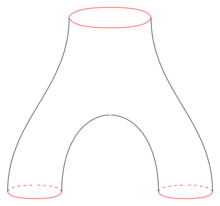 By an immediate recursion this implies that for any surface there is a system of simple closed curves which cut the surface into pairs of pants. This is called a pants decomposition for the surface, and the curves are called the cuffs of the decomposition. Of course there is no unicity in the decompositions obtained by this method, but by quantifying the argument one sees that all pants decomposition of a given surface have the same number of curves which is exactly the complexity. For connected surfaces a pants decomposition has exactly pants. A collection of simple closed curves on a surface is a pants decomposition if and only if they are disjoint, no two of them are homotopic and none is homotopic to a boundary component, and the collection is maximal for these properties. Take a curve in the decomposition in a four-holed sphere and replace it by a curve in the sphere intersecting it only twice. The pants complex is connected (meaning any two pants decompositions are related by a sequence of elementary moves) and has infinite diameter (meaning that there is no upper bounds on the number of moves needed to get from one decomposition to the other). The action of the mapping class group on the pants complex is of interest for studying this group. For example, Allen Hatcher and William Thurston have used it to give a proof of the fact that it is finitely presented. The interesting hyperbolic structures on a pair of pants are easily classified. 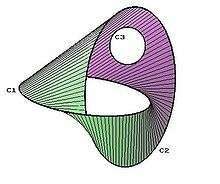 For every there is a hyperbolic surface which is homeomorphic to a pair of pants and whose boundary components are totally geodesic and of lengths . Such a surface is uniquely determined by the up to isometry. By taking the length of a cuff to be equal to zero one obtains a complete metric on the pair of pants minus the cuff, which is replaced by a cusp. This structure is of finite volume. The geometric proof of the classification in the previous paragraph is important to understand the structure of hyperbolic pants. It proceeds as follows: given an hyperbolic pair of pants with totally geodesic boundary the three geodesic arcs joining the cuffs pairwise and which are perpendicular to them at their ends are uniquely determined, and are called the seams of the pants. Cutting the pants along the seams one gets two right-angled hyperbolic hexagons which have three alternate sides of matching lengths. The following lemma can be proven with elementary hyperbolic geometry. If two right-angled hyperbolic hexagons have each three alternate sides of the same length then they are isometric to each other. So we see that the pair of pants is the double of a right-angled hexagon along alternate sides. Since the isometry class of the hexagon is also uniquely determined by the lengths of the sides that were not glued the classification of pants follows from that of hexagons. When a length of one cuff is zero one replaces the corresponding side in the right-angled hexagon by an ideal vertex. A point in the Teichmüller space of a surface is represented by a pair where is a complete hyperbolic surface and a diffeomorphism. If has a pants decomposition by curves then one can parametrise Teichmüller pairs by the Fenchel-Nielsen coordinates which are defined as follows. The cuff lengths are simply the lengths of the closed geodesics homotopic to the . The twist parameters are harder to define. They correspond to how much one turns when gluing two pairs of pants along : this defines them modulo . One can refine the definition (using either analytic continuation or geometric techniques) to obtain twist parameters valued in (roughly, the point is that when one makes a full turn one changes the point in Teichmüller space by precomposing with a Dehn twist around ). One can define a map from the pants complex to Teichmüller space, which takes a pants decomposition to an arbitrarily chosen point in the region where the cuff part of the Fenchel-Nielsen coordinates are bounded by a large enough constant. It is a quasi-isometry when Teichmüller space is endowed with the Weil-Petersson metric, which has proven useful in the study of this metric. These structures correspond to Schottky groups on two generators (more precisely, if the quotient of the hyperbolic plane by a Schottky group on two generators is homeomorphic to the interior of a pir of pants then its convex core is an hyperbolic pair of pants as described above, and all are obtained as such). 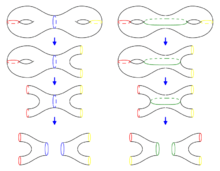 This link cobordism between the Hopf link and the unlink is topologically a pair of pants. A cobordism between two n-dimensional closed manifolds is a compact (n+1)-dimensional manifold whose boundary is the disjoint union of the two manifolds. The category of cobordisms of dimension n+1 is the category with objects the closed manifolds of dimension n, and morphisms the cobordisms between them (note that the definition of a cobordism includes the identification of the boundary to the manifolds). Note that one of the manifolds can be empty; in particular a closed manifold of dimension n+1 is viewed as an endomorphism of the empty set. One can also compose two cobordisms when the end of the first is equal to the start of the second. A n-dimensional topological quantum field theory (TQFT) is a monoidal functor from the category of n-cobordisms to the category of complex vector space (where multiplication is given by the tensor product). In particular, cobordisms between 1-dimensional manifolds (which are unions of circles) are compact surfaces whose boundary has been separated into two disjoint unions of circles. Two-dimensional TQFTs correspond to Frobenius algebras, where the circle (the only connected closed 1-manifold) maps to the underlying vector space of the algebra, while the pair of pants gives a product or coproduct, depending on how the boundary components are grouped – which is commutative or cocommutative. Further, the map associated with a disk gives a counit (trace) or unit (scalars), depending on grouping of boundary, which completes the correspondence. ↑ Ratcliffe 2006, Theorem 9.7.1. ↑ Hatcher & Thurston 1980. ↑ Ratcliffe 2006, Theorem 9.7.3. ↑ Ratcliffe 2006, Theorem 3.5.14. ↑ Imayoshi & Taniguchi 1992, p. 63. ↑ Brock, Jeff (2002). "Pants decompositions and the Weil-Petersson metric". Complex Manifolds and Hyperbolic Geometry. American Mathematical Society. Hatcher, Allen; Thurston, William (1980). "A presentation for the mapping class group of a closed orientable surface". Topology. 19: 221–237. Imayoshi, Yôichi; Taniguchi, Masahiko (1992). An introduction to Teichmüller spaces. Springer. pp. xiv+279. ISBN 4-431-70088-9. Ratcliffe, John (2006). Foundations of hyperbolic manifolds, Second edition. Springer. pp. xii+779. ISBN 978-0387-33197-3.